How does one connect the dots between vitamin C, scurvy, and heart attacks and strokes? 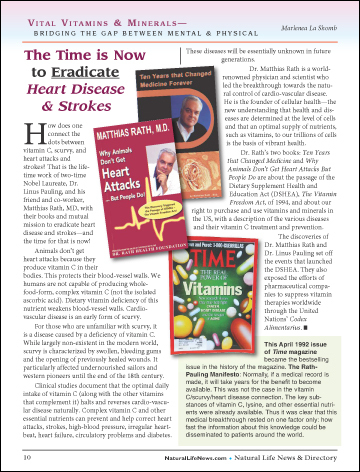 That is the lifetime work of two-time Nobel Laureate, Dr. Linus Pauling, and his friend and co-worker, Matthias Rath, MD, with their books and mutual mission to eradicate heart disease and strokes—and the time for that is now! Animals don’t get heart attacks because they produce vitamin C in their bodies. This protects their blood-vessel walls. We humans are not capable of producing whole-food-form, complex vitamin C (not the isolated ascorbic acid). Dietary vitamin deficiency of this nutrient weakens blood-vessel walls. Cardiovascular disease is an early form of scurvy.